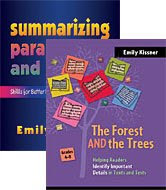 Back in 2008, as I was doing presentations about summarizing, I was surprised that teachers wanted more about text structures--more examples, more resources, more teaching tools. I put this back on Slideshare because I think it would be a great resource for a flipped classroom, or to embed on a classroom website. Do let me know if you are planning to use it in an interesting or exciting way! -November homework will be coming soon! -I used the story "Pumpkin Seeds" from the October Reading Homework this week. We had a great time acting out the story and finding the theme. Text Annotation and "What's My Rule?" I love the promise of text annotation--the idea that students will take purposeful notes on a text, drawing arrows and underlining important ideas, leaving tracks to mark their thinking. Sometimes the reality does not live up to the promise. Instead of taking purposeful notes, kids start to just color in the o's. Writing on a text is a powerful way to connect the unseen world of what goes on in the reader's head to the real world of the physical page. To my young readers, often the concrete world of the physical page completely overshadows the invisible mental work. How could I bring the two together? Even more importantly, how could I do this in a quick 10 minute lesson? I decided to harness the "What's My Rule?" idea from math class. "What's My Rule?" is an easy introduction to algebraic thinking--kids see an input and output, with sets of numbers, and have to figure out the rule. How does this work for text annotation? I told readers, "I'm going to read the first few sentences of this story aloud. As I do this, I'm going to make some marks. Your job is to figure out why I am making these marks." 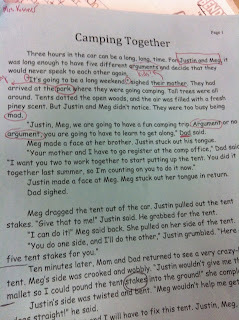 In the first two sentences, I underlined the characters' names. They quickly shared with their elbow partners--"They're characters!" So then I asked the next important question--"Why might it be important for me to notice these names? Why should I underline them?" As we read on, I underlined setting details. This was interesting, as not every kid had the word "setting" automatically. But this is why partner work is so amazing. If a few kids know the right word to describe a situation, very quickly it will spread through the class as the partners share and collaborate. When I circled argument, not one students mentioned the word "conflict"--a clear sign that knowledge of this word was not present in the room and would need some focused teaching. Modeling this way was very quick and allowed me to quickly judge what the students know and what they do not. And it was lots of fun! As I walked around to listen to the conversations, I took on the role of trying to figure out the "rule", or why students had circled or underlined certain places. Octopuses are awesome! I put together a series of texts about octopuses and cuttlefish. You can find them here. This was an incredibly busy weekend at the 46th Keystone State Reading Association Conference. You can find the presentations from the speakers at the conference wiki, which is here. I'm still trying to process it all!